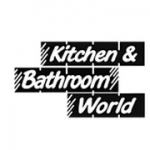 Kitchen and Bathroom World, of Dens Road, Dundee, has one of the longest established showrooms in the area maintaining a commitment to service and choice over the past 30 years. The recent refurbishment of the kitchen display area has seen new manufacturers brought in and the most up to date styles and ranges are now on show.Eleven new displays by the German manufacturer Kuhlmann and British-made products by Symphony are complemented by more than 25 Neff fitted electrical appliance to give the authentic finishing touches. The modern theme is accentuated by the hi-tech stainless steel and aluminium frontage of the ovens, hobs and hoods. The company has 3 experienced designers who will advise the customer on the layout of the bathroom or kitchen and guide them through the specification of the items required. A computer aided design package is operated by the company to enable the customer to envisage how their room will look with the new layout. This can be viewed from any angle in the room. 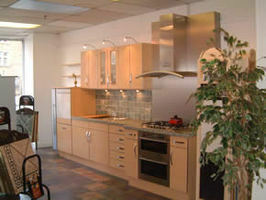 Recent developments in kitchen furniture extend the theme by also including kitchen units in stainless steel. Over 120 different combinations of door finishes are available and that extensive choice means Kitchen and Bathroom World is able to cater for all pockets. The company also boasts no fewer than 30 bathroom displays, giving an insight into the latest trends in bathroom styles and design. A wide range of major brand names is on offer, including bathrooms from Ideal Standard, Heritage, Sottini and shower enclosures from Showerlux, Daryl and Roman.